Need a job? Look to the Madisons for inspiration. I recently had the great pleasure to present some of my research at the Boynton Beach Historical Society’s monthly meeting. At that meeting, I mentioned an article I had found in the Palm Beach Post archives while looking for articles on the orange groves that once surrounded Lawrence Road in Boynton Beach. The article I found told the story of Warner Alexander Madison and his wife Juanita. It’s the type of story that reminds us how much things have changed, and yet that hard work transcends time and can get you through anything. The Madisons came to Florida in 1937 from Des Moines, Iowa, hoping to help Mr. Madison’s health. Mr. Madison was born in 1882 in New York. In 1916, he had contracted polio (or what at that time was called “infantile paralysis”) and was confined to a wheelchair. Land records indicate that the Madisons bought 18.6 acres from the Lake Worth Drainage District, right where Military Trail curves in Boynton Beach, in the vicinity of where Le Chalet Boulevard is today. 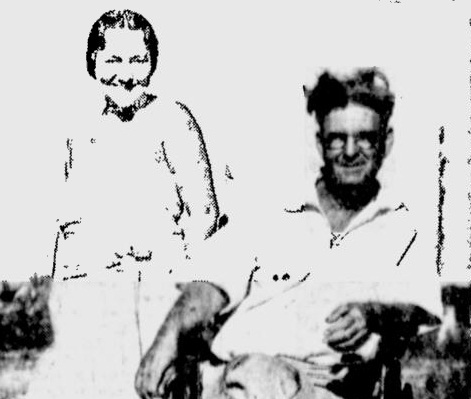 In the first article published April 23, 1939, their story of purchasing the land and living for three months in their car was told. They cleared the land and built a house with the help of the local Salvation Army. A contractor from Lake Worth even mined some rock from the property, creating a swimming pool for Mr. Madison to help his paralysis. Mr. Madison was a Mason, so the local chapter helped him build his house. The article does not give Mr. Madison’s exact age, except that he was past fifty. His wife Juanita had been a dancer and actress on the Keith vaudeville circuit. Mr. Madison was a trained chemist, so he used his skills to create perfumes from the flowers that grew nearby at the Sun-up Grove, owned by Mabel Maull. Mrs. Maull sold the perfumes in her gift shop, and the Madisons finally had some steady income. They planted many acres of roses, planted vegetables which they canned, prepared datil peppers in vinegar for hot sauce, and raised chickens. One of the audience members at the historical society meeting remembered the couple and mentioned that the land became a little tourist attraction called “Madison Jungle Garden.” This gave me another clue to search on the Palm Beach Post archives. I found two more articles on the Madisons, and how they had indeed expanded and become one of those wonderful old Florida roadside attractions which have vanished from our landscape. In the February 11, 1940 article, it is mentioned that Mr. Madison wheeled himself out to their flagpole to fly the flag everyday. It had been a hard year, with a freeze claiming much of their flowers, vegetable crops and datil pepper plants. In the article published November 28, 1941, the Madisons tell of their attraction, how they had blazed a trail to the dense jungle that was in the middle of the property and how they set up picnic tables and a souvenir stand. They even featured an old still that had been destroyed during Prohibition, still displaying ax marks . Mr. Madison made his perfumes, and Mrs. Madison handcrafted novelties from shells, pine cones, palmetto fiber and fronds. She made dolls, hats, wall hangings and brushes from materials on the property. She made hundreds of visors from palmetto fronds and from the proceeds they were able to buy a small refrigerator. To add to the feeling of their jungle, they added some animals such as a bobcat, monkeys, snakes and pheasants. To give the illusion of parrots perched in the trees, Mr. Madison carved the birds from wood and painted them in bright colors. At some point between 1941 and 1953, Military Trail was rerouted to eliminate the awkward westward curve. This meant that Military would cut through the north end of the property. 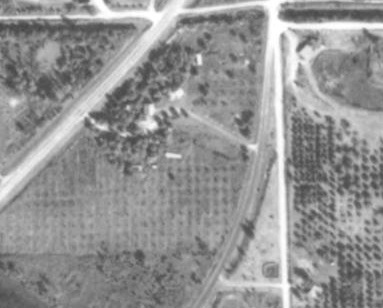 The aerial photo above from 1953 shows that, but it looks like the attraction was still active at that time. I did not find any other articles about the Madisons, so in my next visit to the courthouse I’ll have to see when they sold the land. 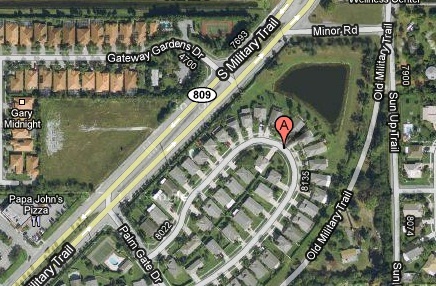 Today the land is the Grande Palms development and parts of Gateway Palms. I am sure that everyday was hard for the Madisons. Being disabled, coming out of the Great Depression and moving to a strange and wild land were all obstacles that the Madisons overcame with hard work and creativity. I will see if I can find out what eventually happened to the Madisons and their little slice of Florida heaven. UPDATE: Through FamilySearch, I found a 1945 Florida Census record for Lantana, Florida that listed a Juanita Madison, age 53, born in 1892. Mr. Madison had passed away in 1944. I also found an obituary in the Palm Beach Post archives for a Juanita Madison Ring, who died in 1961 at age 69 in Lantana. That would agree with the 1945 Census for her age. I think it is her because the listing said that a Christian Science reader would be presiding at the funeral. In the 1939 article about the Madisons, it is mentioned that Mr. Madison had regained the use of his arms from a Christian Science healer. 3 Responses to Need a job? Look to the Madisons for inspiration. Great follow-up story about Madison Jungle Garden. I wonder if anyone out there has any more photographs or even a souvenier from this Florida tourist attraction? In 2002 my wife and I bought a house just east of the Madisons’ property and renovated it. I did not know about the Madison’s until tonight, October 17, 2010. On part of what would have been the back-east side of their property there was an old pencil cactus tree that I believe would have been planted during the time that the Madisons were there. Since that area had become a wild area since their time I helped myself to some cuttings of that pencil cactus (euphorbia tirucalli), one of which is growing beside my house and doing extremely well. The former owners of that property, not the most recent owner, destroyed the original tree a few years ago. Now my tree has taken on special meaning and I will keep it just for that sake. If anyone would like cuttings I’ll be glad to give you some. Thanks for this wonderful history!